There are several options for installing the central vacuum cleaner, depending on the configuration of your home. The inlets are discreetly located, often in skirting boards where the 12 metre-long hose can reach the furthest. The central container can be used with or without a dust bag. Dust ­ flows into the container at such a high speed that the particles are compressed and cannot escape again. 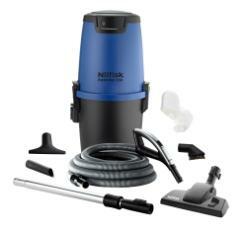 The filter in the central vacuum cleaner has a very large filtration surface which ensures perfect air ­flow. The vacuum unit can be located anywhere in the house, and you only need access to it a couple of times a year to empty the container.